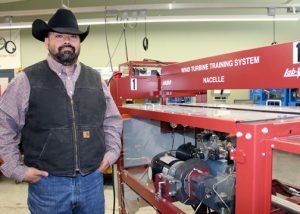 (HARLINGEN) – Patrick Zoerner has returned to where it all started for him and he’s ready to take Wind Energy Technology at Texas State Technical College to the next level as the program’s newest lead instructor. Zoerner grew up in Harlingen with his family, but at 15 his life spiraled out of control with the sudden death of his father. Eventually in 1994, Zoerner enrolled at Keys Academy in Harlingen to complete his GED. Still not sure what he wanted to do with his life, he enrolled in the U.S. Military at the age of 17. The now 40-year-old served 15 years in the military as an Army sergeant, and deployed for one year in Afghanistan. After being medically discharged, Zoerner continued to move forward and enrolled at TSTC. Zoerner worked as a corrections officer full-time while pursuing an associate degree in Biomedical Equipment Technology. He graduated from the program in 2012. Instead of working in the biomedical equipment field, Zoerner decided to stay at TSTC and pursue a second associate degree, which he earned recently in August 2018, in Wind Energy Technology. Zoerner said it took longer to earn his degree in Wind Energy Technology because after receiving his certificate in the program, he was hired by Duke Energy in Lyford. Zoerner also credits TSTC’s Veterans Center and student support staff for his success. Zoerner added that he frustrates easily when he’s given the run around or when his questions can’t be answered. Before returning to TSTC, Zoerner worked for Duke Energy as a wind turbine technician for five years, he said gaining experience and knowledge he can now share with his students. In Wind Energy Technology, students learn to operate machinery they find in the field, plan workflow for turbine construction and maintenance and create machinery and equipment layouts which qualifies them to operate and maintain the systems that make wind turbines function. With a certificate and associate degree path to follow, students can gain employment as wind turbine service technicians, project managers, engineers and operations managers. Zoerner will be graduating in December with an associate degree in Welding Technology, one of his first passions growing up. Wind Energy Technology is offered at TSTC’s Harlingen and Sweetwater campuses. For more information on Wind Energy Technology, visit tstc.edu/programs/WindEnergyTechnology. This entry was posted in Harlingen on October 22, 2018 by Amanda Sotelo Sotelo.